The steering box uses 90 weight gear lube. Lots of people have tired of leaking seals and now fill the box with thick heavy gear oil or grease. If using grease I’d recommend a soft black Moly grease that will stay fluid and not pack away from the moving parts or dry out. John Deere corn head grease is also a popular replacement. Straight STP works well, too. 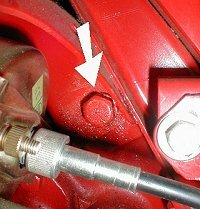 The most common failure with the steering box is a lack of lube to the upper thrust bearing. On the early steering boxes this bearing is above the full level in the box. 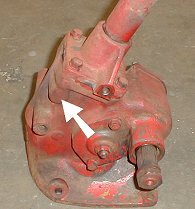 Later steering box designs correct that, but owners still neglected to keep the steering box full and upper thrust bearings continue to fail from lack of lube. Over filling with a free flowing grease seems to solve this problem. 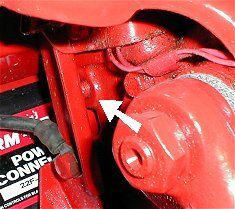 The early (’47-’48) 8N steering box had a 1/4″ pipe plug on the upper right side of the box. 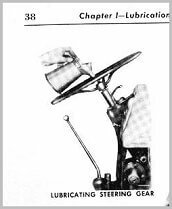 It could also be filled by removing the nut that holds the steering wheel on and pouring the oil down the hollow steering shaft where it flowed out a cross drilled hole and over the upper bearing (very slow process). 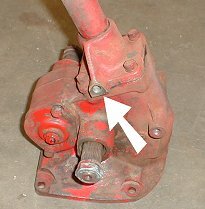 The improved steering box (after 1949 serial number 216989) had a 1/8″ pipe plug on the upper left side of the box hidden under the dash suport bracket and was nearly impossible to access. 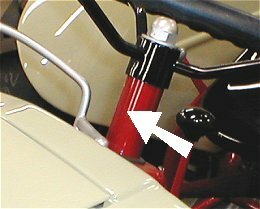 The ’50-’52 models could be filled through the upper right hand side bolt hole where the dash panel attaches to the steering box. After serial number 452913 a screw was added to the front side of the steering column between the dash and steering wheel to allow adding lube from there. 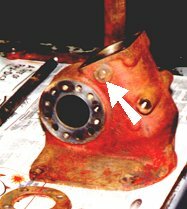 This let the oil again flow over the upper thrust bearing on the way down (a good idea) the same way the early models did.